Description: Remastered and converted to XRCD24 from the analog master tape for a more liquid and natural sound! The ultimate in XRCD sound! Julie London, the legendary torch song singer and pop balladeer of the 60s and early 70s, had a huge hit with her version of Cry Me A River and has always been one of Jacintha's favorite singers. It only seems natural that for this, her fourth album for Groove Note, the sensual and talented Jacintha, no mean balladeer herself, has chosen to record and dedicate an album to Julie. This album is a sheer joy to listen to from the first note. This may be Jacintha's best album yet. 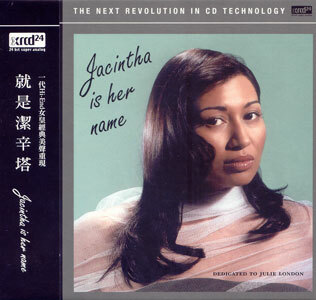 The silky, smooth, and sensuous voice of Jacintha is reproduced with an utterly natural quality, revealing every nuance of her phenomenal intonation, phrasing, breath control, and vocal modulation. Jacintha and arranger/pianist Bill Cunliffe have come up with a spectacular new record, using superb jazz musicians -- most of them from Southern California -- in a simple, duo or trio settings. The very spare instrumental arrangements lend themselves to extremely high quality audiophile sound and Joe Harley (producer) and Mike Ross (engineer) have outdone themselves on this recording, creating sonics and fidelity that are some of the best ever from Groove Note (or any other label for that matter). Absolutely recommended for fans of vocal jazz and audiophiles! Produced by Joe Harley. Recorded by Michael C. Ross at Ocean Way Recording, Hollywood, November 20-24, 2002. This XRCD24 edition released in 2004. XRCD is a high quality CD that is compatible with all CD players.